Finally! “Fast” food on the AIP! When we’re on a healing diet, we spend a LOT of time cooking. Anything that saves us time in the kitchen is a lifesaver. 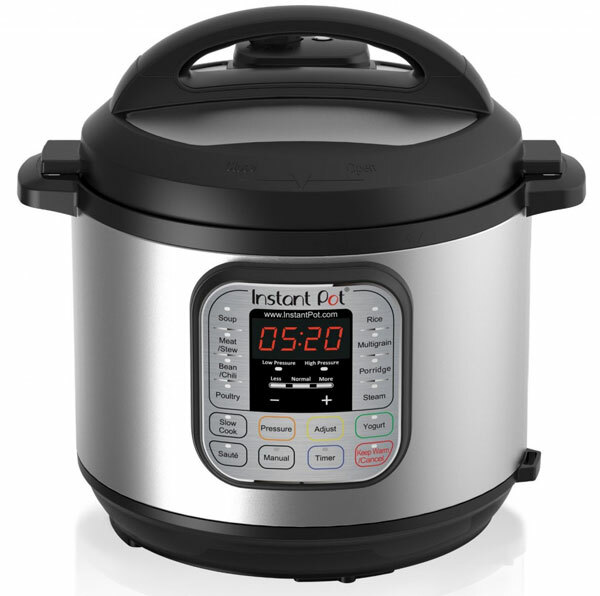 Enter the Instant Pot®! 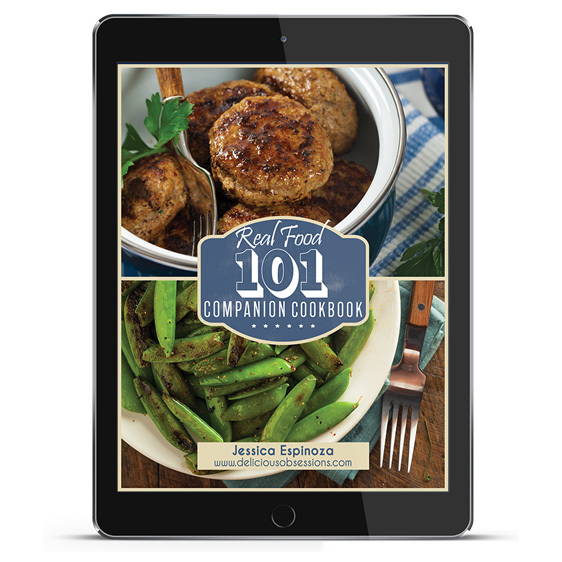 NOTE: Because this eBook is a community cookbook, it is sold on a separate site from this one. You can purchase your copy through this link ($17.95). When we’re on a healing diet, we spend a LOT of time cooking. Anything that saves us time in the kitchen is a lifesaver. 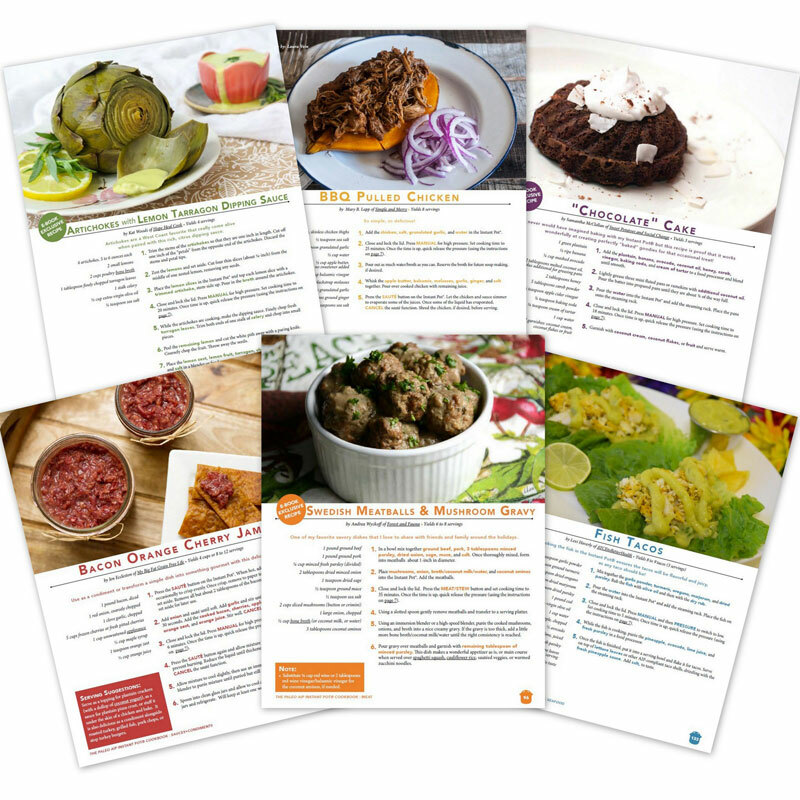 Enter the Instant Pot®! A kitchen appliance that’s many tools in one, its primary function is a pressure cooker, and that’s the focus of this e-cookbook. The Instant Pot® also serves as a slow cooker, rice cooker, steamer, yogurt maker, food warmer, and it has a sauté function (meaning you can brown meat before cooking, and reduce sauces and gravies afterward.) It saves a lot of room in the kitchen by replacing seven appliances with one, and turns many recipes into one-pot wonders. 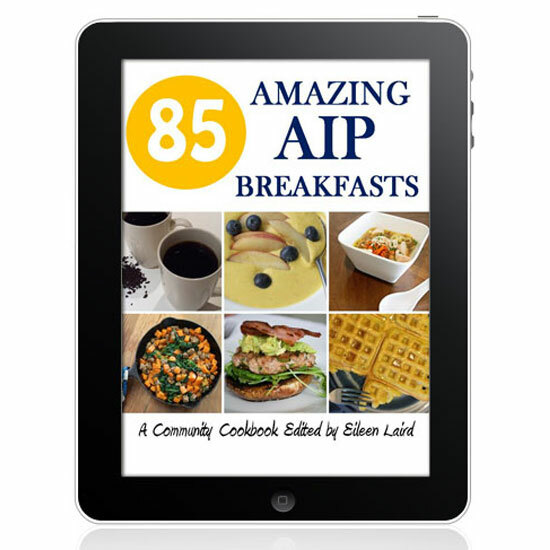 A Community Cookbook From Your Favorite AIP Bloggers! What’s So Special About this eCookbook? 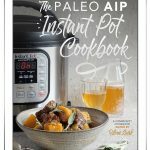 The first Paleo Autoimmune Protocol (AIP) e-cookbook written specifically for the Instant Pot®, a favorite tool in the Paleo AIP community. The IP comes in 3 sizes: 5-quart, 6-quart, and 8-quart. The recipes in this cookbook are written for the 6-quart size. If you have a smaller model, you may need to adjust the ingredients in some recipes down slightly. If you have a larger model, you can cook the recipes “as is” or increase the ingredients by 25%. Cooking times will stay the same. Focuses on the pressure cooker function, creating fast and delicious meals. Are you nervous about using a pressure cooker? No worries. There’s a tutorial in the front of the e-cookbook. 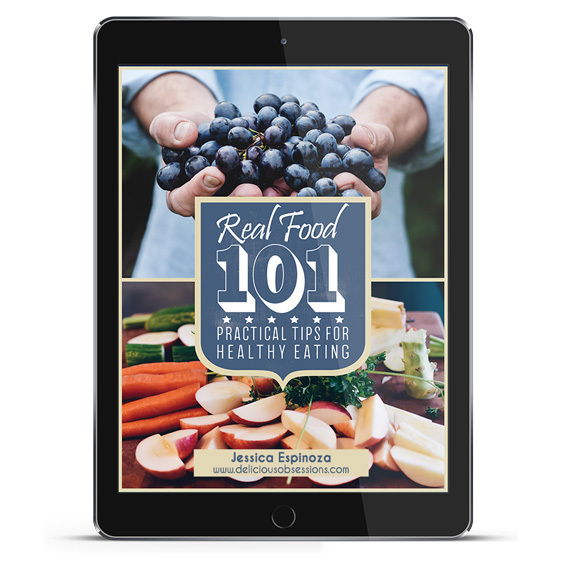 Features over 140 recipes, including Broths, Sauces/Condiments, Vegetables, Poultry, Meat, Seafood, Organ Meat, and Dessert. Packed with flavor with such diverse recipes as: Bone Broth (of course), Cranberry BBQ Sauce, Marinara Sauce, Cauli-fredo Sauce, Bacon Orange Cherry Jam, “Baked” Sweet Potatoes, Cauliflower Rice, Artichokes with Lemon Tarragon Dipping Sauce, Smothered Okra, Creamy Kabocha Squash Soup, Fall Off the Bone Whole Chicken, Mole Chicken with Bluecumber Salsa, Lemongrass and Ginger Chicken Zoodle Soup, Stuffed Acorn Squash, Turkey and Gravy, Speedy Chili, Teriyaki Garlic Beef, Ukrainian Borscht, Sticky Pork Short Ribs, Pork Vindaloo, Lamb and Apricot Curry, Simple French Navarin Lamb Stew, Chicken Liver Pâté, Steak and Kidney Stew, Tongue Tacos, Jambalaya, Steamed Crab, Leek and Shrimp Risotto, Salmon and Sweet Potato Chowder, Poached Pears, “Chocolate” Cake, Pina Colada Tapioca Pudding, Mini Pumpkin Pies, and over 100 other fabulous recipes! 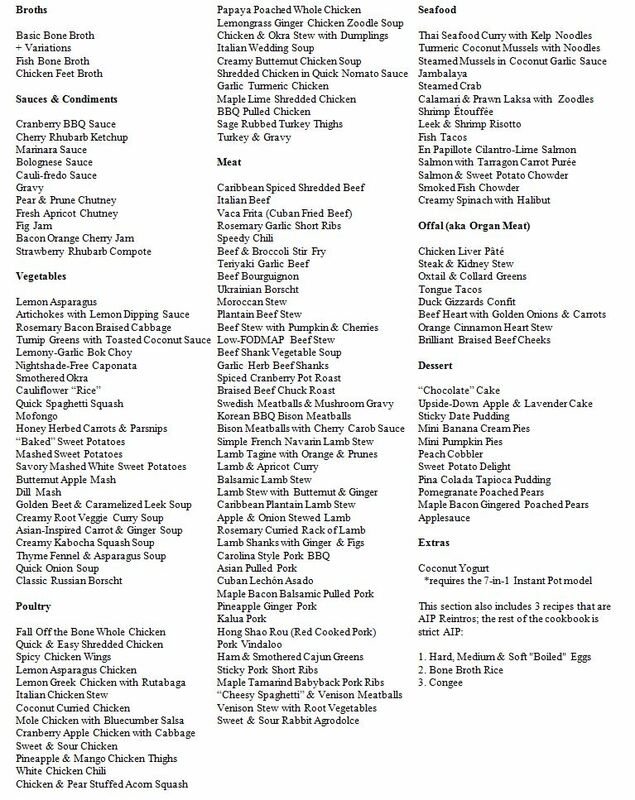 Here’s a link to the complete recipe list. 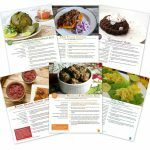 Written by 37 AIP bloggers who have used the paleo autoimmune protocol to improve their own health. The result is a book far better than any one person could have created alone. 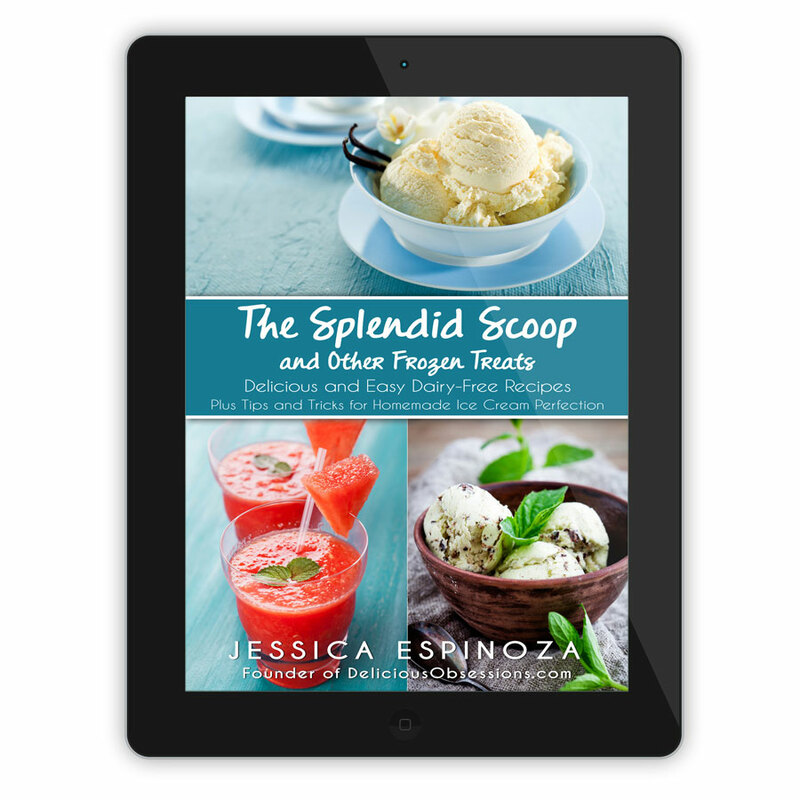 NOTE: Because this eBook is a community cookbook, it is sold on a separate site. Click here, or the button below to purchase this amazing book for only $17.95. It’s time to enjoy “fast” food on your healing protocol. Less time, less stress, more flavor. You deserve it. 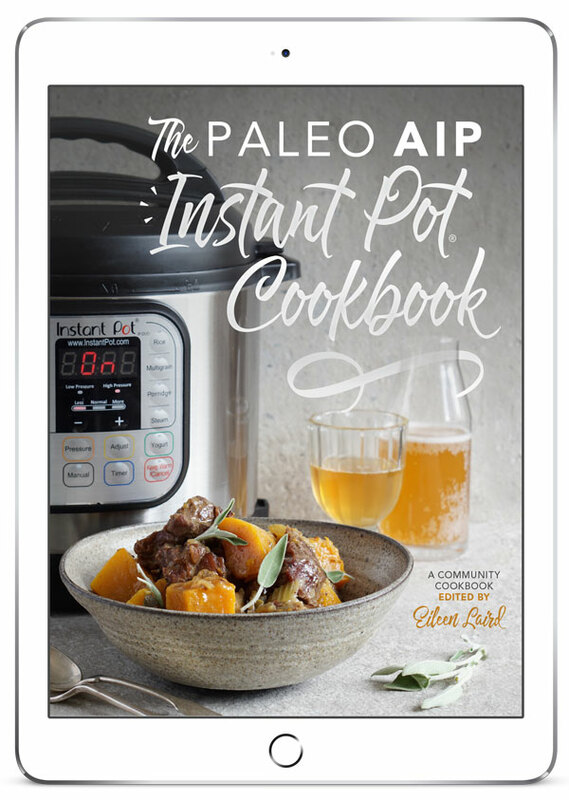 Download your copy of the Paleo AIP Instant Pot Cookbook for only $17.95. 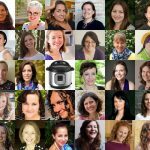 Don’t Have an Instant Pot®? 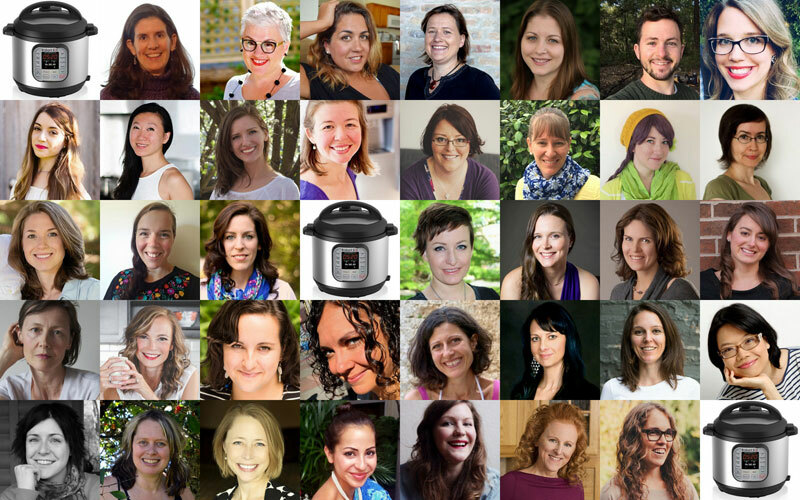 Want to Learn More About the Instant Pot®? Check out my formal review of the Instant Pot® here. 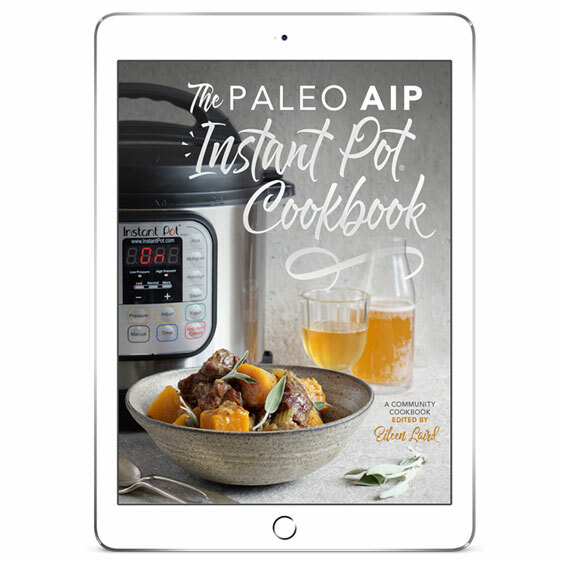 Get a recipe for an incredible AIP (autoimmune protocol) “Chocolate” Cake made in the Instant Pot® here.